This is a life saver. This product was recommended to me by a friend and since I started using I haven’t had any regret whatsoever. Have been using it for all my kids. I recommend. It’s such a wonderful item to have on your baby shopping list. I bought this when we went abroad to sterilise bottles and dummies. It was so simple and easy to use and there was no need for a microwave or electrical supply just cold water and the tablets. The box does appear to be quite bulky but I filled mine with socks and clothing to make sure I didn’t waste space in the case. It was perfect for what we needed and gave us peace of mind that our baby’s bottles were sterilised. I love this its so easy and quick to use. Very easy for travel too. And can leave bottles in there untill needed. Can use any bottle aswell if decided to change brand. My first born was premature and I brought this nearly three years ago for use at home as we had one in hospital. I love that you can put your bottles, dummies, teats, most teething toys in to it and it only takes 15 minutes and then they are ready to use again. The tablets/sterilising solution is cheap to buy and lasts long enough as you only have to change the water once per day - pretty much every shop sell some kind of sterilising fluid/tablets too so it is really accessible! I am still using this to sterilise my five month olds bottles etc. three years later it is still in perfect condition. I have not had any problems and can not find any faluts with this product. I can fit in four MAM bottles at a time too so can do bulk sterilisation or single. It isn't costly at all and is the easiest form of sterilisation I have tried. My bottles haven't lost any colouring or marks from the solutions/tablets we have used in the three years we have used it either, which is a massive bonus! Love this product! As a 1st time mum i wasnt sure of what steriliser to go for. I had advice to stay away from microwave ones as they make the bottles very hot. With the cold water sterliser you can take the bottle out and use it straight away, without rinsing. Only down side is that the water can make your hands dry and crack. I love this steriliser!! 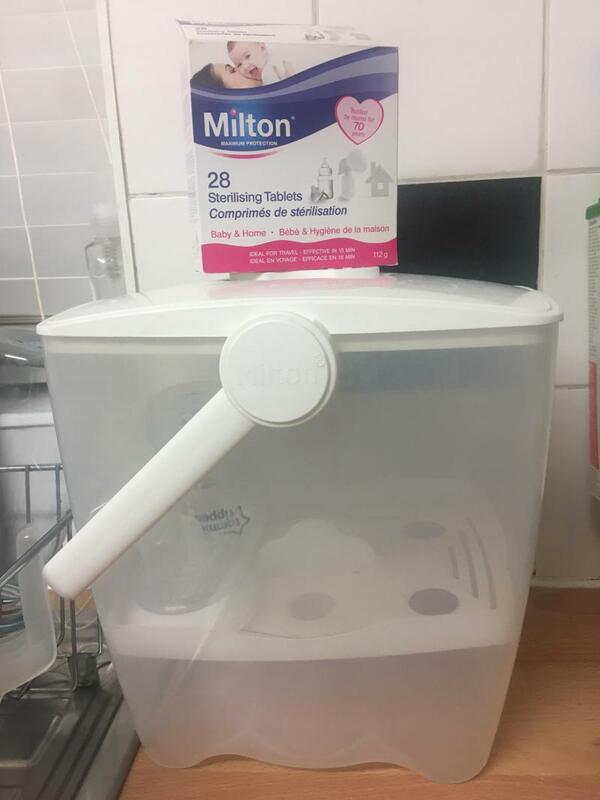 It’s so easy to use, fill up to the required amount, pop in a Milton tablet, add your bits to be sterilised and they’re done in 15 minutes! Parts are sterile in there for 24 hours, which is amazing! So much easier than having to constantly precisely measure water for an electric steriliser, and you can easily pack this up and take with you on your travels. The only downsides I would say is that it doesn’t come with tongs to get products out, and all tongs you can buy ice foubd are tiny. Constantly reaching my hand into the water has made it so dry, so I’m trying to find a way to get bottles and tears out without dunking my hand in. It’s also quite small if you’re using 9oz bottles. Ours fits around 4-5 bottles in, but we use specialist colic ones which have numerous parts, and the design makes it quite hard to fit all the fiddly parts in. 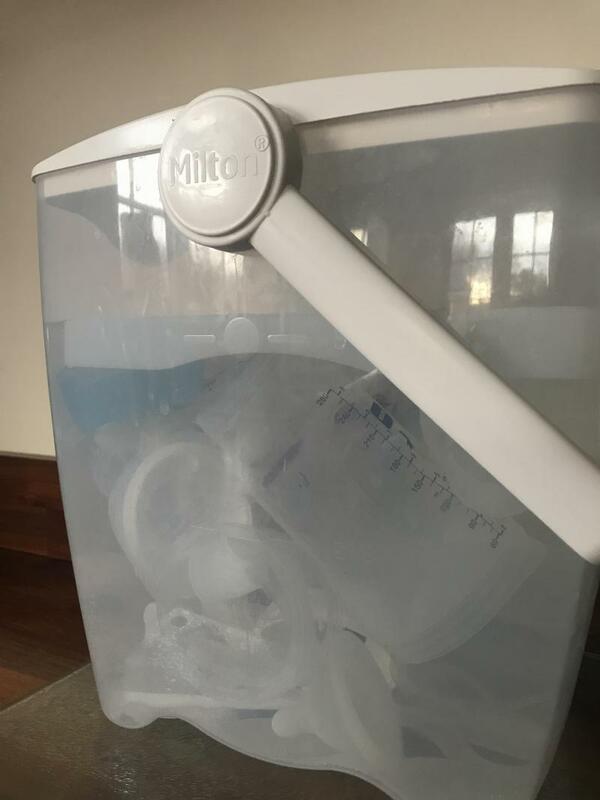 I’d never go back to have an electric steriliser now, the Milton cold water one is what hospital used when my first was poorly s a newborn, and I can totally see why. Easy, convenient, cost effective and secure! I never realised how easy it would be to use. Ease, amount of bottles, travel ready, and hospital grade sterilation. Love that you can bring this anywhere and don't need to be by a plug! Can fit so many bottles in it and one tablet lasts a whole 24 hours! This is what they use in hospital so why the need to buy all these steam ones and faff about I haven't a clue! This is the best. Price point is brilliant. Easy to use and bottle ready to use as soon as bottle is taken out. No need to rinse just shake dry. 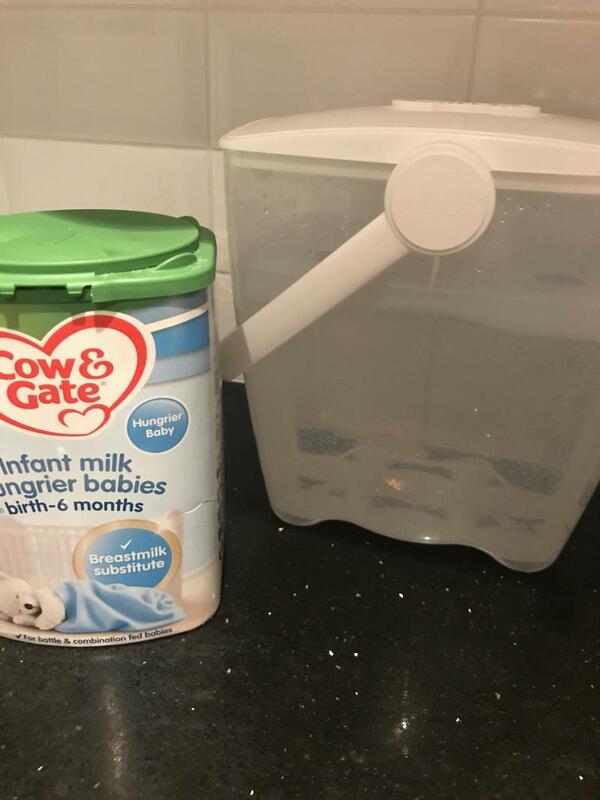 Quick and simple way to sterilise baby’s bottles in next to no time. It removed the oz marking from my baby’s bottles.Not sure if it was the Milton or bottles. 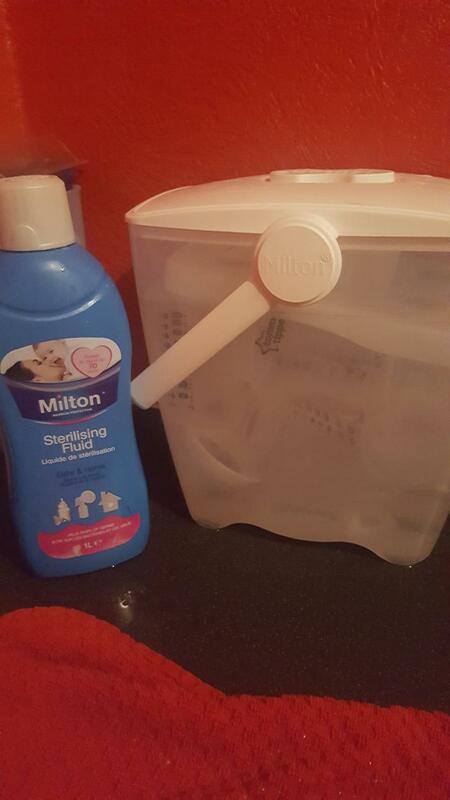 Quick,safe and effective way to sterilise your baby’s bottles.Both Milton tablets and steriliser container cheap and well worth the money.Ready within 15mins to use.Great for mums on the go.Easy to pack up and take away can use pretty much anywhere providing you have access to fresh running water. So easy to use! Only has to be changed every 24hours. Always ready to use. No waiting around! Can stain kitchen worktop so just be careful when using. I love this product! It’s so easy to use. Put in the cold water and a tablet. Wait 15 mins. And everything is ready to go. Only needing to change the water every 24 hours. It’s great and so convenient. Also very cheap! Easy to use. No electrical source needed. Only needs changing every 24 hours. I started off using an electric steriliser but quickly found it needed de scaling quite a lot and the bottles were really hot coming out and could only fit 4 small bottles in at any one time so I spent a lot of my day stweilising! This Milton one was recommended to me so I thought I would try - brilliant! It’s so easy to use and no electric source needed! I love how I only need to replace the water every 24 hours and it is very cost effective in relation to an electric one. the only down side to this is the water level indicators on the unit are quite hard to see so have to look quite closely to make sure I’ve the right amount of water in it. other than that it’s easy and it’s brilliant and the price is amazing. Love this!! Due to medical reasons I had to get this for my son and I am so glad I did. So much easier than other sterilising methods. It’s quick easy and when water needs to be changed u can use it before tipping out to clean down work surfaces baby toys high chairs etc to keep everything clean and sterile for your little one. I use the tablets for a while but found they took a bit longer to dissolve now I just buy the fluid you pour a cap full in fill up with water to the line and add the bottles. It’s that easy. Wish I knew this on my first and second born children would have saved me so much of my time. I planned on exclusively breast feeding and when my baby was born prematurely I had no choice other than to express milk for her whilst in the nicu, they used these sterilisers and they was fantastic, as soon as we was discharged and went out to mother care and brought one for home. It’s only small the box so fits on my kitchen side nicely really quick to change the water and is quite cheap compared to other sterilisers that I had seen. I highly recommend it to everybody now. 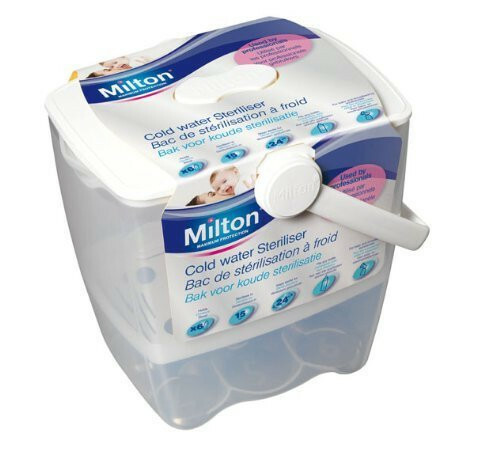 I've always used a water steriliser I personally think they are cleaner, I used to have the old brown Milton steriliser 18yrs ago so will always swear by this brand. We bought this product after we were a bit tired of using the conventional microwave sterilisers. We wanted something easier to use which didn’t require other equipment and so we went for this one. It comes with minimal instructions as literally what’s needed is 5L of cold water and a cup full of the steriliser liquid. You combine them together put all the items you need sterilising in and let done. It works very well but leaves a strong smell of chemicals behind on each bottle and if you leave the items in the solution for too long they all start discolouring and become sticky and in some cases no longer usable. Overall I would recommend this product for travelers but not for every day use. This steriliser is a great product I personally am a huge fan of cold water steriliser over the electric or steam because it takes no time to set up and use and get one with and takes up little space if needed to take with you anywhere. 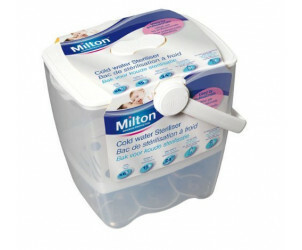 The Milton Cold Water Steriliser is specially designed for cold water sterilisation, as recommended by Professionals. Can accommodate all bottles and breast feeding equipment and keeps items sterile in the solution for up to 24 hours.